Media mogul Rupert Murdoch has singled out the mobile market as a means of pushing his empire forward following a torrid last 12 months. The wrinkly Aussie has split News Corp in two - a publishing and an entertainment arm - as a damage limitation operation following the phone hacking scandal that killed the News of the World. As he looks to refocus his operations, Murdoch sent an email to staff highlighting the importance of smartphones and tablets to both companies in the new era. He wrote: "Today there are 30 million tablets in use in the US and 75 million worldwide. In five years' time, there will be at least 75 million tablets in the US and 375 million in the world. "Smartphones will get far smarter and grow rapidly over the next 5 years, from 120 million active phones to 225 million in the U.S., and from 835 million to 1.7 billion in the world. "These technologies will permeate all parts of life - including education - and it is my firm belief that these two companies will be best positioned to compete in this rapidly evolving global economy and distribute our premium content on these platforms." Murdoch's efforts to penetrate the tablet and smartphone markets have enjoyed mixed success so far. There's been little uptake since The Times newspapers went behind the paywall, while The Guardian has launched a much more user-friendly, talet-specific edition of its newspaper. The expensively-assembled The Daily newspaper, launched initially as an iPad exclusive alongside Apple, but has had little impact. 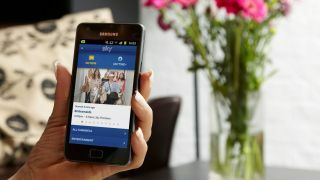 On the flip-side of the coin, the suite of applications offered by UK-based Sky TV brand partly-owned by Murdoch are second to none in terms of delivering on-the-go television content.